The Covenant: Brotherhood of Evil by ALLUMINATION FILM WORKS LLC at Chocolate Movie. MPN: AFW27380. Hurry! Limited time offer. Offer valid only while supplies last. An ancient artifact in the form of a demonic cane unleashes a conspiracy of unspeakable evil upon humanity in this pulse pounding horror-thriller. An ancient artifact in the form of a demonic cane unleashes a conspiracy of unspeakable evil upon humanity in this pulse pounding horror-thriller. After up and coming PR exec David Goodman (Edward Furlong) is passed over for a promotion at work and blinded by a seemingly random attack in the street, he's willing to do anything to see again. 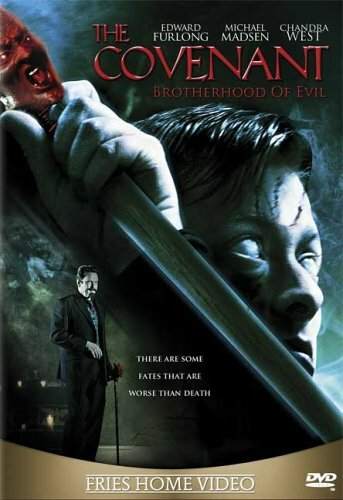 Guillermo List (Michael Madsen), a shadowy accolyte from hell, promises to restore David's sight and ensure his corporate success if the desperate young man will pay the ultimate price...his soul. If you have any questions about this product by ALLUMINATION FILM WORKS LLC, contact us by completing and submitting the form below. If you are looking for a specif part number, please include it with your message.